There was another birthday too - what was it, 30th, 40th? Can't quite remember - the weeks go so fast when you're so busy, one just runs straight into the next. This was part of a Sunday lunch party we did a few weeks back - the day after we had cooked the suckling pig for the same family. Raspberry and white chocolate (love the raspberry icing on this one - used this recipe for the cake, but without grown-up supervision. Buttercream icing with raspberry coulis), coffee and walnut (adapted the white chocolate recipe) and black forest (using this recipe). 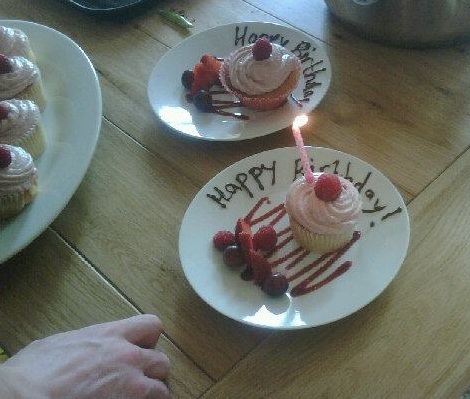 While we plated up the 2 birthday ones, the others we just plated up the garnish which allowed them to choose their favourite flavour. 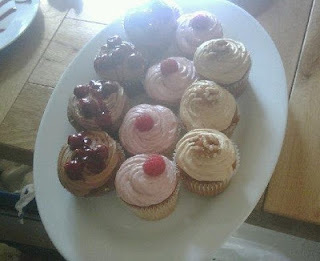 Of course there were a few left for them to have later in the evening too - there's always time for cake!